Two SENATORS enter with VOLUMNIA, VIRGILIA, VALERIA and young MARCIUS, all in a procession followed by nobles and, even further behind, some commoners crying out their gratitude and celebrating. Behold our savior, the lifeblood of Rome! Call all the people together, praise the gods, and light all the city's ceremonial flames. Throw flowers in the streets, choke down the words that banished Marcius and replace them with the welcome of his mother. Cry, "Welcome, ladies, welcome!" A huge burst of drums and trumpets is heard. All exit. VanWagoner, Benjamin. "Coriolanus Translation." LitCharts. LitCharts LLC, 19 May 2017. Web. 23 Apr 2019. VanWagoner, Benjamin. "Coriolanus Translation." LitCharts LLC, May 19, 2017. 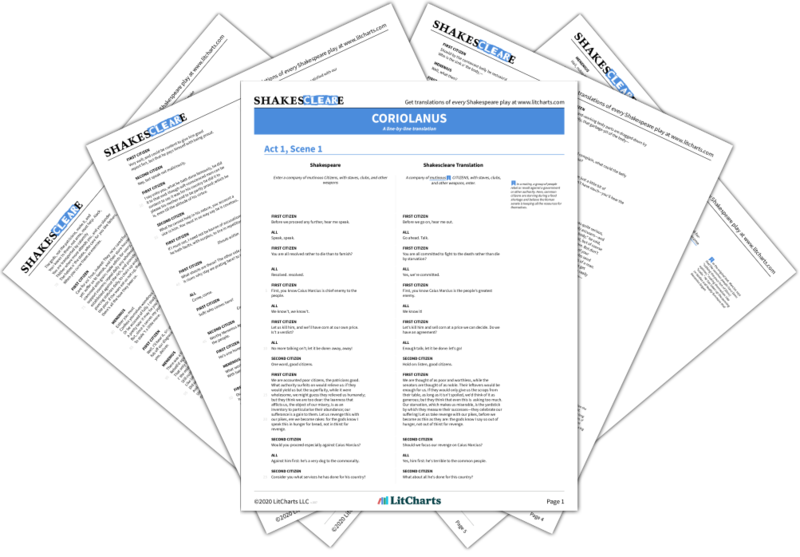 Retrieved April 23, 2019. https://www.litcharts.com/shakescleare/shakespeare-translations/coriolanus. Join LitCharts A+ and get the entire Coriolanus Translation as a printable PDF.